Welded steel construction designed for demanding industrial laboratories, or distributed processing systems applications. A full range of chassis are available from 3 to 23 slots, rack mounting or NEMA enclosure mounting. In addition, a range of power supplies are available for each model. The Chassis are designed to operate over a temperature range of 0 to 60 C and are current limited and over-voltage protected for all outputs. The Polybus International Family of rugged chassis are designed to accommodate VME, VXI, IBM-AT BUS and Multibus-compatible card cages/backplanes. All enclosures are welded from 16 gauge sheet steel or .09" sheet aluminum. Finishes are polyurethane paint for steel and aluminum, or anodized aluminum. 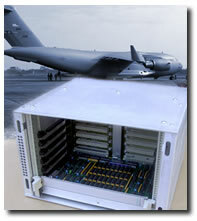 Mounting options include 19 inch rack mounting and/or panel mounting. Front-loading enclosures include panels with quick release hardware for convenient card access. Electrical hardware includes a power line EMI filter, input protection and safety devices, high volume positive/negative pressure cooling fans, and the requisite Vac/dc power supply. Power supplies operate over a temperature range of 0 to 60 C with current limiting and over- voltage protection on all outputs. An input power failure signal for system power down indication. A wide range of power supplies can be accommodated from 130 to 1500 watts with various Vac and Vdc inputs.